Counseling and therapy services in Spokane, WA for men and women who experience anxiety or substance abuse problems. Learn more about our exceptional anxiety counseling in Spokane, WA. Fees: The initial 60 minute intake session is charged $175 with subsequent sessions charged $135 per 45-minute session. Extended length sessions of 55-minutes are offered for $145. Payment is due at the time of service using cash or credit/debit card. Missed sessions or cancellations less than 24-hours prior to a scheduled appointment are charged $80 (client responsibility). You will be asked to provide credit card information to be kept on file for billing and missed session/late cancellation fees. Insurance: Before you decide to use your insurance benefits for therapy, please be aware of the following: Your insurance company requires I provide them with some of your personal information in order to facilitate payment. This may include when you were seen, your diagnosis and treatment summary information including symptoms to justify the need for treatment ("medical necessity"). This information may impact job prospects, ability to obtain future coverage, life insurance acceptance and rates. Depending on your circumstances, you may not want this type of information disclosed to an outside party, therefore you should give this decision careful consideration. Additionally, you may be seeking therapy to address life circumstances that do not qualify for a diagnosis; in this case, your insurance will not cover the cost of the sessions. I am a contracted provider for some insurance companies. Session fees are billed directly to your insurance and payments for these sessions are usually based on contracted amounts that are preset by your insurance company ("allowables"). Please be prepared to pay $165 toward your first visit pending confirmation of your exact insurance benefits. Missed sessions or cancellations less than 24-hours prior to a scheduled appointment are charged an $80 fee and not billable to insurance. It is recommended that you call your individual insurance company to verify your "outpatient mental health benefits," including copay, deductible/coinsurance amounts and if telemental health sessions are covered. Contracted Insurances (In-Network): Blue Cross Blue Shield, First Choice Health Network, Premera Blue Cross, and LifeWise. For other insurance providers, you may be able to obtain out-of-network reimbursement for all or part of the session cost. 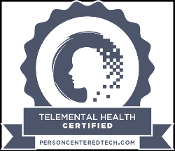 Telemental Health can be a great alternative to in-person therapy for people who live outside the Spokane area, have a limited amount of time for a session (i.e. during a lunch break), would like additional confidentiality, or during hazardous weather conditions when it’s just too difficult to get to my office. Sessions are conducted using a secure and confidential video platform. All you need is a strong/reliable internet connection, a private space where you won’t be interrupted, and a laptop or tablet (a cell phone will work). Session fees and policies are the same as for in-person therapy. Your insurance provider pay cover part or all of the video session; most insurance companies do not cover telephone sessions. Please be prepared to pay the full session cost at the time of the session pending confirmation of your exact telemental health insurance benefits. I meet the Washington State Department of Health's requirements as a clinical supervisor for licensure hours. Individual supervision is charged at $135 per clinical hour (50-minutes). Group supervision is charged at $95 per clinical hour (2 to 5 associates).